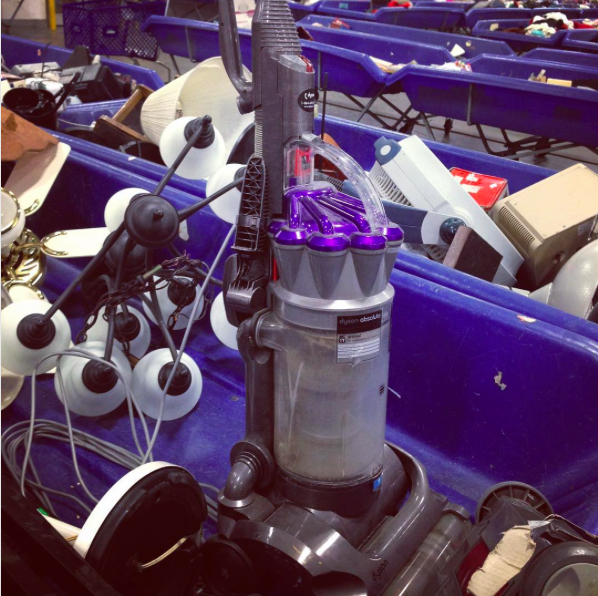 I picked up a Dyson vacuum cleaner at the pay-by-the-pound Goodwill Outlet store while thrifting with my mother. I paid a budget-worthy twenty bucks for this bad boy which needed nothing more than a thorough cleaning. The thing was crammed full of dust and crusty dog hair, but it’s now immaculate inside and out thanks to an instructional YouTube video on how to crack open the cyclone. I currently have it for sale up on Craigslist, but I’d just as happy to keep it as I would to sell it. I kind of love that part of what I paid for was the weight of the filth that crusted the inside of this vacuum cleaner. I worked the last two days and I brought my own food, drank the free crappy coffee and enjoyed the free lovely tea. I know this unexciting “frugal thing” shows up repeatedly, but much of living a simple and balanced life is about daily small choices. I set up my backyard clothesline for the season which has prompted day after day of thunderous rain drenched weather. That’s okay though, as I wouldn’t expect any less from my beloved Oregon. Today is my husband’s birthday, so I’ll be planning out a day of adventures for him this weekend as he doesn’t have time to celebrate until then. We stopped exchanging gifts a long time ago, as neither of us need anything and it was a waste of money and a source of clutter. Studies have indicated that experiences make us happier than stuff, to which I wholeheartedly agree. I didn’t buy a Lear Jet or a vulgar Позолоченная квартира в небе. I’ve been making two epic dinners a week from the pantry/freezer that give us leftovers for the whole week, and they’re not even boring! Bonus: I made a batch of brownies that lasted more than week. Sweet treats every day! PiC gifted me with a beautiful tiny potted plant for Mother’s Day – less than $10 and they’ll look wonderful in our future garden. My daughter once found a working sewing machine at the bins for just under $9; she cleaned it up and sold it for three times that amount! Every trip to the bins was an adventure – we used to go at least once a month – and we’re all still wearing items we found there (for pennies). I don’t post Five Frugals all the time because they would be the same over and over again. 1- I batch my errands when I go to my yoga classes in the next town, which is where the stores are. 2- I did make a separate trip to Target this week but I had to hit the bank and the pharmacy too–I did it to avoid going in Walmart. I’ve already been in there about 3 times this year and that’s more than I prefer. 3-I made meals that lasted for two nights each (most always do) with one lasting for a third time around–last night’s smorgasbord to use up food as we are going away for a car weekend on Thursday. Now I can’t make leftovers tonight or tomorrow. Tonight is ok–pork cube steaks, potatoes fried with onions and peppers, and probably green beans. Might be green beans left over but we can eat those tomorrow. NO idea for tomorrow yet, except the green beans. That’s tomorrow’s problem. Tomorrow is my sister’s birthday and I have to wrap her 4- gift, which I got on sale/coupon so down to less than 50% original price, and she’s getting some homemade choc chip cookies too. She is always feeding us, so I decided I’d turn it around on her for a change. My other sister and I are taking her out for lunch tomorrow also. 5- I still have half a dozen doughnuts in the freezer that she gave my husband for his birthday—it took us several days to eat the first half dozen. We’re trying to lose weight/eat less sugar, and it is difficult. The doughnuts are huge too. 6- I mended another pair of underwear this week, and my granddaughter’s dress, which had a tiny rip under the arm. I sewed both armpits while I was there. I usually do that when it’s a two sided item. I was going to mend a torn sheet until I stuck my foot in it and decided it’s definitely not worth the trouble. Too worn. 7- I will salvage the less worn parts for another use instead. It’s a fitted bottom sheet. 8- I have an older one I can use until I find the perfect sheets to buy, a matter of both quality and price being in balance. My other set will be replaced too, as both were bought at the same time and are in about the same state. Like Katy, nothing earth-shaking, just everyday frugal habits over and over again. 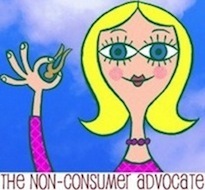 I’ve never participated in the 5 Frugal Things before! Exciting! Thank you, Katy, for inspiring me to feel such glee about all the little frugal successes. 1. As I do everyday, I brought my lunch to work (a salad made with lettuce grown in my backyard). I also brought a thermos of homemade coffee and am currently drinking free La Croix sparkling water provided by my employer. 2. I voted in the special election! Civic participation feels so good. 3. I get to enjoy a free dinner made by the hostess of tonight’s book club meeting. Great food and discussion and friendship – the best things. 4. It’s sunny(ish) in Portland (holy crap!) so I will take a walk this afternoon. Free vitamin D.
5. I will use my credit at Buffalo Exchange get some new-to-me jeans and t-shirts. Free! I would love to be the first to welcome you to posting here. We love new ideas here( and old ones, too!!) and I love your number 4. Never thought about the fact that vitamin D is free, but indeed it is! I went for a walk this afternoon as well! Had to drop my ballot at the library to save a stamp. Went to the rhododendron garden in Portland a couple of weeks ago. I bet it’s even prettier now. I understand if you show up just before they actually open, you can go for free! It’s free admission on Mondays and Tuesdays! I gave my personal vacuum cleaner a good cleaning yesterday also. I washed the filters, clipped the threads wrapped around the brushes, and wiped out the dust and dirt. It is much more effective and it keeps the doggie smell away. 1) The gardenia bushes that I planted earlier in the month are blooming. I cut some of these wonderfully fragrant flowers and they are floating in a bowl on the table by my chair. Unfortunately I can’t smell them, for I have a cold. Grrrr …. 2) Despite my cold, I ran a few errands that had to be done. This included returning a video to the library so no late charges. 3) We were given tickets to a professional sporting event this past weekend. We were able to walk, so there wasn’t any need to pay for parking. However, outside food and drinks were not allowed, and we knew this would be enforced. We ate before leaving the house so we would not be hungry. Although we had to buy water, we soon discovered that we could refill our bottles at no cost at first aid stations. It is frustrating to be in 90 degree heat and have to pay $4 for a 16-ounce bottle of water. 4) The older of my two sons lived locally and wanted to treat me to dinner out for Mother’s Day. I suggested that we cook out instead. He brought the food and did the cooking. My husband cleaned up. Best of all, there were leftovers! When it comes to frugality, I try and lead by example. Regarding #3, even when no outside food or drink is allowed, an empty beverage container is usually allowed. We just bring an empty water bottle and fill it up once inside. I can’t stand paying $3 or more for a bottle of water! Good point. Even though I wasn’t sure that I could fill it, I should have brought a bottle anyway.This event was a bit challenging. It took place on an outdoor course, so few water fountains, no fill stations, and only a few permanent facilities. That is why we were so happy that they let us refill a bottle at the First Aid Station. On a side note, I wish more public facilities would replace water fountains with fill stations. It is better for the environment,;and although it might not be true, I perceive it to be healthier. Water fountains gross me out. 1. Had a cousin spend the night last night and declined her generous offer to take us out to dinner. Made a lovely smoked salmon chowder with fresh (on sale) corn and a yummy salad, more relaxing for everyone and much cheaper for her! 2. Received a beautiful floral arrangement from my financial advisor for mother’s day which I took to my mother-in-law who loved it. Also baked her a loaf of her favorite banana bread. 3. Sister in law gave me some pretty tulips for mothers day, put those in cousin’s room to brighten up her guest experience. 4. Brought breakfast to work yesterday and today. 5. Went Goodwill shipping Sunday with a gift card from my Mom, bought a couple beautiful small hand carved picture frames, a gorgeous pair of brand new buttery soft black leather ballet style flats and a sugar bowl with lid with half off tag. 6. Treated cousin to Starbucks this a.m. with gift card I received for mother’s day. I told the nursing staff this tip incase future families needed a place to park. They had never heard of it. You know, a sign you see every day but may not pay attention to if you don’t need the service. (2) I packed a alpaca shawl I use on planes as a blanket, the neck pillow I use when travelling, hand lotion, because the constant washing/antibacterial lotion is drying. Refillable water bottle and unspillable coffee mug. Threw in some granola bars. They all fit in a cloth shopping bag. (3) The shirt and hoodie had to be cut off my family member.Clothes were returned to me. Shirt was a soft jersey, unfortunately neither could be mended so.. I used strips of the shirt to wrap some fragile items for packing. (4) The unit we were on ,gave each patient a food voucher in addition to the evening meal . We went down and purchased a variety of edible items that our family member would prefer to eat. Hope your family member is ok! Prayers…I so understand the ER stress, since it seems to be my second home these days…… I keep a packed bag in my car, along with snacks….hugs and I hope your family member is ok!!! Hello Cindy. While in ICU, I thought of you and wondered about how you and others manage employment and emergency care when these types of situations occur. It can impact ones finances immediately and drastically. I treat hospitals like an airport. You can have long waits, the temperature can be variable and you don’t know how long you may be there and when/what food options are available. In addition I bring a book and knitting . I had a great conversation with one of the nurses when she saw the needles about what she knits. Though it has been awhile since a hospital admission, this is a chronic condition. Good to go in prepared both for comfort and frugality. I have to work to keep the insurance, so I go to work, then go to the hospital, stay the night, leave at 4 a.m., go back home and feed animals, shower, then go to work and repeat….lol. I so understand the chronic condition. I let frugal things go like homemade meals, although I do keep granola bars like you mentioned, and I just try to eat cheap stuff at the cafeteria. I keep a package of ham and bread at the office for lunch, and boiled eggs at the house for breakfast on the run. The night meal is the problem and the gas….hugs and I hope your relative is feeling better soon (you too)!!!! My daughter had a very premature baby and the little miracle spent 114 days in the NICU before coming home. I say miracle because she weighed one pound 7 ounces at birth. We really learned about what to take to the hospital and it really helps to have things to make you comfortable. The baby came home in December and is doing remarkably well. We are thankful every day. I find dysons at my local goodwill all the time. I figured if so many people are unhappy enough with such an expensive purchase that they are donating them they probably aren’t worth having. Is Dyson all hype? We bought a Dyson maybe maybe 15 years ago – back when there were several dogs in our lives that shed like you wouldn’t believe. That was also back when we had carpeting in our home. At the time, I’d say the Dyson was definitely worth the money – other vacuums couldn’t keep up with the dog hair and burned out. We no longer have dogs, and we don’t have a speck of carpet in our current home. We do still have the Dyson and use it on the “bare floor” setting. My husband does, anyway. I just grab a broom or dry mop. Maybe there are more old Dysons in thrift stores as more people get rid of carpet? I have a dyson and love it – it’s brilliant for dog hair. I particularly like emptying at the end of every session so you can see how much you’ve sucked up. Very satisfying. But my friend who also bought one hated that you could see the grime and loathed the emptying and got rid of his – so I guess it’s horses for courses! We bought a Dyson (new) about 5 years ago for about 400$, thinking it was the bomb and it would be so amazingly worth it… Well, I don’t like it. At all. Would not buy a new one. Was it clogged? I only ask because apparently that’s a problem with their cyclone technology. 1. The deck has needed to be sanded and stained for a few years now. My husband rented a power sander and did a great job sanding it and replaced some boards. Then the two of us put the stain on (including all the rails). It looks like a brand new deck and we probably saved a couple hundred dollars doing it all ourselves. 2. My daughter has been sleeping on my husband’s old mattress that he’s had for close to 30 years and it’s really no longer comfortable for her. We got her a new mattress but instead of paying $100 to have it delivered, we rented a U-Haul for $35 and picked it up ourselves (sadly, we don’t know anyone with a pick up truck somehow!). And, just five minutes ago, a woman came to pick up our old mattress which I sold to her for $25. 3. I have about 26 things listed on ebay. Have been going through my kids old clothes, my clothes, shoes, etc and listing stuff on ebay. I’m slowly building my paypal account back up by selling extra stuff we have sitting around the house. 4. Just paid for my son’s second soccer camp for the summer with my Paypal money (earned by selling excess stuff!). 5. I never really go to garage sales but for some reason stopped by one close to where I was attending book club and found a pristine Tekk Soccer Rebounder goal! My son is huge into soccer and these are selling on Amazon for $280. I got it for $80 and he already loves it! It’s great for him to practice without having to have anyone with him (because it rebounds the ball back to him!). Re: #1 – I normally handle “deck maintenance” such as light sanding, re-staining, etc. myself. We’ll be having the exterior of the house painted this summer, and my husband wants a bid for the deck work, too. I told him that he can get bids on that but I’m just about certain that when he sees the cost he’ll be fine with me doing the staining. We have a huge wrap-around deck and I can only imagine the cost of hiring someone to work on it. It will be interesting, though, to find out how much I’m actually saving by doing this myself. I’d guess you’re right and you saved AT LEAST a few hundred dollars by doing the maintenance yourself. Great savings! Laughter is free, as is a sense of humor. Your last one made my coworkers ask questions because i was laughing so loud! 1. I walked up to the grocery store to buy a couple of bananas and found coins in the Coinstar. A nice surprise. I also used my debit card and requested cash back. Our credit union dropped a lot of ATMs that we used to be able to use fee free. 2. I made burrito bowls for dinner. Quick, cheap, easy, and probably a lot cheaper than than Chipotle. 3. Entertainment last night was getting together with a group to knit/crochet things for others. Cheap fun. 4. I submitted receipts/EOBs for reimbursement from our Flexible Spending Account. It doesn’t do any good to have money in an account if you don’t claim it. 5. Booked a rental car through COSTCO Travel for a trip we’ll take at the end of June. It was so much cheaper than any other rental car method. We keep the membership mostly for that purpose. Of course, I’ll check a few times for a cheaper price before we travel. 1. Almost KonMari’d a perfectly beautiful dress because it wasn’t bringing me joy, then saved it at the last minute. Wearing it today with a cardigan sweater, and it’s like, the ultimate teacher outfit. 2. Eating a carrot from the fridge right now, before they go bad. 3. Bought a $6 pizza last night for dinner from down the street, which is so not frugal for many people, but so much better than our $25 bad takeout habit. Frugal fail: turned in library books a day late, will have to pay fines. Happy birthday to your husband, Katy! 2. My sister passed along a stack of magazines to me, as she often kindly does. She gets them for free too from someone else. They’re always many months old but that doesn’t matter to me. 3. One article was in a Money magazine from last year, and it talked about the correlation between wealth and health. So very interesting! I love both those topics and didn’t realize how much they went hand-in-hand. It was motivating for me to keep up my walking, see my doctor on a regular basis, take good care of my teeth, lift weights sometimes, etc. 4. A Goodwill will be opening five minutes from my house soon. I saw the actual opening date on a sign there for the first time. I put it on my calendar and plan to be there on that first day. 5. I thought of something I always do … when I go on a field trip I ride on the bus with the kids. A lot (most, maybe) parents drive their own vehicles. I understand why; the bus is crazy loud. But to me it’s free transportation. I thought of that one because I had a field trip with my son today. (2) I also do casual weeding every time I pass by a garden area that needs it. I was just out where I let the catnip and fennel run wild next to the street, so I plucked some catnip sprouts and brought them in for our (indoor only) cat. I now have one completely stoned cat rolling around on the front hallway tiles. (3) Mr. Bestest Neighbor planted my leek seedlings for me yesterday. He’s 80 years old, but he’s got two sound knees to my one, and he enjoys both the good deed and the ego boost, I think. (5) I also gave the BNs a Gardeners’ Supply self-watering hanging basket pot I wasn’t using. Unused pot out of my basement, and something they want to use for them. 1. Picked up a telescope from a fellow freecycler that’s moving. We will take it when we go to TN for the full solar eclipse in August. I need to order our eclipse glasses soon! 2. DS#2 wanted another Ikea Poang chair for when he goes back to college and will be living in a house. I got the one he has, last summer on FB yardsale group for $20 and then found a brand new cover on CL for free a few weeks later. Found free one on CL last night from someone moving back to OK. Picked it up today. DS is thrilled! 3. Friends of ours are moving to FL so she gave me all of her canning jars, some plastic shoe boxes and a really cool large enamel canister full of baking soda. I use baking soda in the washer for DSs “aromatic” sports clothes. 4. Check your digital coupons if you shop at Safeway. Mine had a free package of diapers in my Just ForU offers. Considering my “baby” just turned 20 it’s not because of anything I bought! I’m putting them in my gift closet for the next baby shower I attend. 5. Went to soft opening for new Harris Teeter grocery store tonight. Lots of food samples! I bought strawberries which were 4/$6. They rang up at $3.49 each. After pointing it out, they spent almost 10 minutes trying to fix it. After it was all done, they said since I had been so patient and it took so long they gave them to me for free. 4 lbs. for free! 1. I’m traveling quite a bit, but that means expensed meals on my company, so I have no complaints there! 3. We harvested tomatoes, squash, and yellow beans from the garden. We ate the tomatoes with dinner and they were wonderful! 4. I made homemade “snack packs” to eat on the road, instead of stopping for junk food. 1. I cut open my husband’s old tube of toothpaste – after he said there was maybe one brushing worth left. I’ve been using it for almost two weeks, and there’s still toothpaste left. 2. Son and his family came up this weekend for a marathon he ran. Nature provided lots of free fun for the grandchildren – rock collecting, hiking, fish gazing, and pine cone collecting. 3. Prepared almost all the food for the family’s visit from foods I already had on hand. 4. We need to stay in a hotel in the near future. I’d made a reservation, but have continued to check the rates at the hotel. And was rewarded today to see the price dropped $17.50 per night. A quick call to the hotel got me the new rate – and saved me $35. 5. Friends are taking us out to dinner while we’re away – doesn’t free food just taste better? The toothpaste tubes with the wide caps (so you can stand them upside down) have an enormous reservoir of paste left when you can’t squeeze anymore out. I’ve been using the toothpaste left in one I cut up for almost a month now! 1. While walking the dog in this run down field, I found a McDonalds gift card. There was no one around, so I felt no guilt taking it. Went to McDonalds and it had $87 wroth of credit on it!! I have heard all the lectures on how bad the food is for you, but I love their fish fillet sandwiches and their grilled chicken sandwiches, so I will be enjoying one or two of those a month until the card runs out. 2. This is courtesy of my husband. I needed something to prop up the plastic I cover my plants with until our nights are reliably above freezing. While taking a load to the dump the next day, he found an old, shabby window frame with no glass in it. He brought it home and used it to make temporary stakes so the plastic will stay above the seedlings instead of crushing them. 3. Made a vat of ham/corn/potato chowder to use up aging ham and potatoes. I still have one more package of ham in the freezer to use up and I will, even though I don’t really like ham. Re:#4….I do lots of things for our two dogs that I never did for our kids while they were still at home and the kids remind me ….lovingly. Oh the things we do for Puppy Love! Totally get it! Would you mind sharing your ham, potato & corn chowder recipe? Sounds good! 1. Someone left a water bottle on the counter at work for over a month. I asked if anyone owned it and no one claimed it. I will put it to good use. 2. When we cleaned out the fridge at work someone was going to throw away some canning jars. They came home with me instead. 3. I planted some seeds that I had forgotten I had. Hopefully they will take and I won’t have to buy any tomato plants. 4. I needed to buy some stain and mulch so I bought gift cards for the hardware store when I was grocery shopping. I earned 20 cents of per gallon of gas by doing so. 5. I also was able to use a $5.00 coupon for the mulch. 2. Found 35 cents at Target where I didn’t buy anything but what was on my list. 3. Took advantage of “free shipping to store” and a sale where I got shorts and tees for less than 50% of regular price. 4. Stopped at a Goodwill I don’t usually shop at because it is farther away. Found several Target items, some still in the store at full price–my purchases were about 25% of that. 5. Husband got my garden box done for my Mother’s Day gift. It will be the gift that keeps giving year after year! 1. I have negotiated one day a week working from home, freeing up two hours of travel time, saving money on petrol and my sanity. 2. I was looking at our BBQ and mentioned to my husband that we barely used it this summer. He said it is because we are not buying meat much nowadays (or at least the kind of meat that goes on a BBQ). This is true – since our daughter became a vegetarian we have reduced the amount of meat we buy and changed the type. We definitely spend a lot less on meat now and eat a lot of meatless meals. 3. I cooked a pork roast over the weekend (haha in direct contradiction to what I just wrote) and we ate it for three meals and two lunches, I am making stock with the bone and I saved the lard and rendered it for use in pastry. That one small piece of pork was used for a lot. 4. I baked and cooked a lot over the weekend: muffins, cookies, chilli (meat and vegetarian), soup, bolognese. I filled the freezer up for lunches. 5. While working from home today I am wrapped in a blanket and additional jumpers so I don’t need to turn on the heat. It is starting to feel like winter. My daughter headed off to her school camp in shorts and a t-shirt. Kids are crazy. I know this won’t be useful to you now, but we use our barbecue as an outdoor oven when the weather is too hot up here. I cook bread and veg on the grill (bread goes in a pan on the top shelf). My family’s favorite is focaccia, in a cast iron pan, on the barbecue. It keeps the house cool(er), and we still get fresh, homemade bread. My friend even uses it for muffins, scones, etc in the mornings. Whoa, what a cool idea to bake bread on the grill! I’m going to have to look into this, because I just love me some homemade bread all year long. I did use it to boil our Christmas pudding on Christmas Day! That was honestly the last time we used it. It’s a good BBQ so I should come up with other ways to use it when the weather warms up. 1. Up super early for 4+ hour drive to her assisted living facility; stayed 4+ hours; drove 4+ hours home. Long day, but no overnight hotel stay, and since we took my vehicle instead of husband’s saved about half the gas his would have used. 2. Hubs took her chocolate covered strawberries from grocery store for Mother’s Day (no clutter). 3. We took her out for lunch (which was not frugal but gave her a change of scenery and a treat. She and I both drank water with our meals. 4. Back at her place I gave her at least a half hour foot rub (free, much appreciated, and helps with swelling/fluid retention). 5. Her medic alert necklace was causing her some skin irritation (metal allergy) so I will make a non-metal alternative with jewelry supplies on hand for her to try out and see if it will work without causing any irritation, and it will be small and light enough to mail in an envelope with a single stamp. Kathleen, it is so great that you got your mother -in -law out for a change of scenery. When my father was in the nursing home one of my favorite things to do was just take him for a ride. Sometimes we’d get an ice cream. It was so important to do that for a man who loved to be outside all his life. I am grateful that I was able to do that for him and cherish the time I had with him on our outings. Thanks, Pattilou, it was such a great visit. I wish I could take each of the residents for an individual day out of treats and attention. 1. Bought all our meat for the month in bulk, and on special. 2. Had breakfast yesterday with a friend. Maybe not frugal, but he lives far enough away that we meet at a mall in a town halfway for both of us. Also drove alternate routes to avoid toll fees. 3. Planned my next knitting project – a cardigan for my son, using wool I bought 2 years ago. 4. Living the fact that the vegetable seeds I planted are sprouting. Way cheaper than even buying seedlings. Peas, Brussels sprouts and spinach. 5. I need to buy a few winter uniform items for my son; please hold thumbs, Frugal people, that I can find what I need at the school thrift shop! 1. Took a packed lunch to work today including leftover pasta, fresh fruit, mixed nuts and popcorn. Yum! 2. I was down a car for the first half of the week so did my first online grocery shopping order with free (first time) delivery. Was happy with the friendly service and the extra 6 (free) eggs I received. 3. I only buy one magazine per month and this weeks issue came with a great subscription deal, saving me over $40 for the year and it comes straight to my front door! 4. Sold a few of the kids outgrown clothes and toys on Facebook, netting me over $70 so far! 5. Decided to cancel our fortnightly cleaner as she had put her prices up. Got the kids to help me out instead and saved us $36 ($2 each went to the kids for pocket money). 1. It was healthcare week at work so I received a free dinner Tuesday night; a bag of Pepperidge farm cookies from my boss; a small insulated lunch bag which I traded for an insulated cup; and a donut, bag of cracker jacks and small bag of animal crackers from the safety fair. 2. I went shopping at Kroger is Saturday, and they had great samples including a huge chocolate dipped strawberry. 3. Gave the cookies to my daughter in law and a bag of bacon pancake flavored English muffins for my son from my favorite thrift store. 4. I signed up for more free magazines, which I peruse then take to work for the Crisis waiting room. 5. I bought a used wicker chair and footstool for a price I could live with. I planned to recover the footstool cushion so I took the cover off and washed it, then took off all the Velcro and the piping for reuse. The cushion still smelled smoky after I sprayed it with white vinegar then febreeze so it had to go. I have a stash of worn bed pillows I will use to stuff the cushion. 2. My niece’s graduation from college is this week and I am giving her a check. 3. My mother’s day brunch was lovely but way more expensive than I had budgeted for. My mother is so worth it though. 4. Due to seeing clients on Saturday (which is a good thing) I missed 2 plants sales. 5. A lilac plant I bought died. The two others are thriving though. 1. Using up everything in fridge before I go away for the graduation. 2. Hung laundry to dry. 3. Started to watch Foyle’s War on netflix. really good! 4. Planning a bbq for the Sunday of memorial day weekend. Friends will bring their bocce set and beer and other friends will bring veggie kabobs. Chicken and hot dogs, salad, pasta salad and brownies will be done for under $25. I love making good food from inexpensive ingredients. 5. Seeing a client on Sunday as I don’t get back from the graduation until Saturday when I usually see her. I love, love, LOVE Foyle’s war. When we had finished watching the entire series I was so sorry because it meant that there were no more to look forward to! It is totally different, set in Canada in 1900 and a mystery series but great acting and funny, too. It is called Murdoch Mysteries—watch the series, not the three movies they made of the books (they sucked). 3. Called my internet security provider as my subscription expired and asked for a discount….they cut 50% off of the price. 4. Not exactly frugal….but we needed new chairs for our smaller space.Shopped all over, found the best price, and then used a coupon to get an extra 15% off the total. 5. Used Prime for free books and magazines, used the library for books and dvds, and VOTED – the best bargain in this free country !!! Ann- I feel you. That switch is hard to flip. The truth is that being frugal gives a sort of satisfaction that is hard to duplicate by spending. After years of saving, it is hard to change. And it is not only seeing your savings balance go down a tiny bit, it is more about changing your way of thinking. Spending more just seems wasteful when you know that you can be just as happy without spending. Thanks, Rosanne! It is hard to explain, but you got it. We have been blessed with good jobs and saved SO much that now it does feel strange. It will be an adjustment, but I am going to try and live in a spirit of abundance – while still being frugal – and enjoy the blessings we have. 1) I have a whole pile of returns waiting for me to take on Friday, hopefully. It’s all small stuff, but $4 here and $6 there for stuff we didn’t end up needing makes a difference. 2) Lunches have been salads made of leftovers and Aldi produce. 3) My husband and I are celebrating our anniversary today by sneaking off to an art museum. A date is much cheaper when daycare is already paid for. We are splurging on an exhibit that has a fee. But at least my fee will be only $10. That is the same price as a student membership, which I will go ahead and get because if we decide to eat in the cafe, which is actually considered very nice, we’ll get a discount. 4) This is our 14th anniversary. Long, happy marriages are frugal. I would like to say I have worked really hard keep our marriage happy and our relationship strong in the interest of avoiding an expensive breakup. But it turns out I just married the best guy in the world. 5) I agree about experiences being better than physical gifts. We like to talk each year about what the traditional gift is for that particular anniversary (it’s ivory this year), joke about the extravagant things we are buying each other, and then cook a meal together. 1. Made-do packaging for an ebay sale. 2. Finished up all the leftovers last week without any going bad! This is exciting because somehow we had a wealth of leftovers last week, and the fridge was too full. But we did it! 3. Using up the milk that’s threatening to go bad this afternoon. I’m making blueberry scones for tea, and leftovers will go to breakfast the rest of the week. 4. Hung my laundry out yesterday, even though the weather was cold, grey and still. Got almost three loads dry — the still wet items will go back out today instead of going into the dryer. 5. Shopped Grocery Outlet for my daughter’s birthday party. I found organic crackers for 99cents, brie for $2.99, and cereal to make puppy chow for 99 cents. Made brownies and ice cream pie myself. Used reuseable party supplies. Played charades, and the kids played outside. Had a great time for cheap! Not frugal, but funny: I needed a particular pair of pants for my son to show at the fair. They weren’t in his room, they weren’t in his laundry. In short, I searched every textile in the house, and they weren’t ANYWHERE. Finally, in desperation (just before I was going to go buy some!) I thought to check the dryer, and found them! It has been so long since I used the dryer that I didn’t even think to look there! But we found them in time, and he showed, and did well at the fair! 2. Have eaten all meals at home this week and have been eating down our freezer, so our food expenses in general are less than usual. 4. On Sunday, we swing into the grocery store to grab our sides for the Mother’s Day dinner we were hosting for MIL. Hubby asked if I wanted Starbucks, and I replied that we had Starbucks-brand coffee at home-he could get some if he wanted to but I would prefer drinking it at home. In hindsight, he was probably trying to treat me because it was Mother’s Day. Oops! 5. We’ve been down to one car due to a hail storm taking out my car. So yesterday I walked to the grocery store, a Goodwill (where I bought nothing), and to the park for a picnic with the Toddler. Free exercise and no gas spent. 6. My in-laws gave me a Cold Stone gift card for Mother’s Day. I’m not currently eating sugar, so I’ll pass it on to my mom as part of her Birthday present. She’ll love it! Many frugal fails and anticipated fails this expensive month of May! A few wins too. 1. Arranged a lunch for a friend who just lost her daughter. There were four of us and we split the bill three ways and treated her. We also all drank water which lowered the bill considerably. Good food and conversation. 2. Shopped at a local GW and didn’t find anything except a couple of books which I will read and donate back. 3. Thankful for the reminder of other posters and Katy that it is the frugal habits of everyday life that add up into real savings. Example of failure to adhere to this advice: Husband and I like to travel up north to visit a nature sanctuary. Close by is a dairy that sells quality well priced cheese. However, they also have a gift shop filled with pricy extras such as gourmet crackers, teas, wine, and a small restaurant. By not packing supplies, we purchased lunch, gourmet “toasts” from France and sodas for a much more expensive excursion than anticipated. Thinking and planning ahead would have been the frugal option in this case. 4. Have continued to pack lunches all week plus hosted DS#2 for dinner last night serving him his favorite requested pasta dish. He misses having a dog so he gets a kick out of walking our dog around the neighborhood with my husband – free and good bonding time. 5. To replace the flowers I received for Mother’s Day, will pick garden flowers for a homemade and free bouquet. Love those spring blooms! Janine, I have a good friend who lost a child (just a few days ago) as well. I feel a little bit consumed by it and am trying to remember to count my blessings and just do what I can do, if that makes sense. I’m sure that the lunch you arranged and treated your friend to was a tremendous comfort to her. Thanks, BJS. It just seems against nature to outlive one’s children. It was a small gesture, but we were all old friends and the conversation flowed smoothly. I think it turned out to be beneficial for all of us. Bless you both for caring about your friend whose child died- just wanted to mention that it (having loving friends) means the world to those of us who are in that situation. Also that there are some things that only people who have “been there” can help with, and for that kind of support there are The Compassionate Friends and Bereaved Parents of America. You may want to check out the websites. Jenny, I’m so deeply, deeply sorry for your loss. That has to be an indescribable kind of pain. Thank you for your advice. I’ve had people tell me what you said — that I just need to let her know I’m there for her and to just listen and cry with her. I’ll gently mention the two organizations to her at some point as well. I’ll keep you in my prayers, for comfort and peace. 1. Croissants and coffee for breakfast — the croissants were day old baked goods, a box of 12 for $1. Coffee from my 99 cents a lb. buy at Grocery Outlet. Real half & half makes it special. 2. Was hungry after a meeting yesterday and could easily have stopped somewhere to eat, but realized I could have a steak sandwich if I made it myself at home. Cost $1. Saved $5! 4. Went grocery shopping and bought only the things I needed! Yay! 5. Ordered “seconds” tennis shoes for my walking. Regular $77 but got them for $26 w/ tax & shipping. I really don’t like shopping in stores. …. Fighting the urge to buy some new things I want rather than need… Need: Litterbox & Jeans. Want: Dresser, Fan, & Curtains. The difference between need and want is about $300. Yikes! * I mentioned a couple of weeks ago that I was looking to buy Ecco shoes but waiting for a sale, since they are so expensive. Couple days ago I was walking and saw a “free pile” on a porch. Went and found… a pair of Ecco sandals, looking brand new!!! I could not believe it. So I brought them to work to clean them (I work in a hospital and we have extra strength-against-every bug possible wipes) and they fit perfectly!! Yayayyy!! Ecco sandals are arount 150$ new so it’s awesome! * Still taking outside walks, getting all the Vitamin D I can soak up! 1. I bought 50% off cheese, which didn’t ring up, but I let the cashier know and he checked it and gave me the discount. 2. I’m trying to download some free ebooks, although my kindle is running really slow right now. 3. Even though I was tempted to buy some chips at the store, I opted for pretzels which were significantly cheaper. 4. Just finished reading a biography that I got from a free box. 5. We spent $0 for Mother’s day. I sent my mom and mother-in-law an ecard, my husband called his mom, and my daughter picked me some flowers. Love doesn’t have to be shown in $. It can be shown in words and action and it doesn’t have to be on a certain day the businesses choose to make lots of money off of, it can be everyday! 1. We are having a no spend week. Paying bills only, plus $15 budgeted for groceries and $40 for gas as we have some traveling to do. 2. Just got back from the grocery store and went over my budget by 4.46. But I forget to use a rain check last time I was in the store, so I present customer service with the receipt and rain check and was refunded 10.50, so I am calling grocery trip a success. 3. We homeschool. I listed some curriculum on a page and thwy were grabbed up almost immediately. After media mail shopping, I cleared $140. 4. Resisted buying a drink or snack while I was running errands today. I ate right before I left the house, and took a drink with me from home. 5. Listed somw household itwms on a lical FB swap and aold one itwm for $25 and the other for $10. Trying to get rid of clutter and sell or donate this week. 1. We had the Grandparents over Sunday for Mother’s Day dinner. We had an inexpensive meal of burgers, brats and sale purchased country ribs that my husband cooked in his smoker. They brought the salads. We are still eating the leftovers. 2. My Son-in-law was in town. We wanted to see him and have dinner. He was sneaky and paid for dinner before we arrived. It was my Mother’s Day gift from he and my daughter. They also wrapped up a roll of toilet paper and put it in a gift bag( a family joke). 3. Picked up my flowers to plant in my pots. I used a gift card given to me by my husband. I also purchased my Mother’s plants as her Mother’s Day gift. We both had coupons for $10 off. I still have a little left on my card and we got bonus coupons for future purchases. I chose herbs and a few flowers to plant in my pots instead of filler plants. So I will be able to cook with them and not just look at them. It’s just as pretty. I also dug up some Thyme that was from last years pots and will do the same with some mint. 4. My daughter and I volunteered Saturday at the ReStore. Afterwards I purchased some brand new paint rollers for my next project that were super cheap and got some mouse traps that they had. 5. My daughter’s car is at the mechanics. Instead of driving her to and from school, I let her take my car and I stayed home the last two days. Saved on gas and I got a lot done. I don’t work so this is easy for me. 2) We took my parents to brunch for Mother’s day using gift cards. My Dad paid the tip. Company was priceless. 3) I have been washing and putting blankets and outerwear away for the season. Very warm here today, but historically, as soon as I do this we will have a night below freezing. 4) I need to exercise more for my overall well being – weight and wardrobe. So I dug out the Wii disks this week – Zumba and Wii Fit (aerobics, boxing, etc). This way I can look ridiculous in the privacy of my own basement. 5) The other day I sat down with just a few minutes before school pick up and thought to myself “What can I do with 15 minutes to save money?”. I had just opened up The Tightwad Gazette when my friend (+ neighbor) phoned to say she had just gone through all her son’s clothes and would I like to stop by and pick up what might work for DS? (She is in a hand me down network for parents of multiples.) I had a happy 10 min visit with her, she decluttered a closet and DS has some really nice long sleeved shirts for next season. Wins all around! 4. Made me laugh, which I needed! Ditto! It also makes me think that I need a wii. 1. bought a Keurig at a 1/2 price rummage sale (end of the 3rd day) that no-one else bought for $10. Sold it for $40. 3. listed several items on a local FB sale site while I continue to clean out and get rid of some of the excess around the place. 4. planted the garden, shopped smarter for what I need and only bought the number of plants I actually want. And still planted w/ seeds for several things instead of buying already starter plants. 5. toughing out the heat wave that is expected for 3 days tops and not turning on the A/C…. Husband is out of town so he’s not here to moan/groan about the heat. 1) After a couple of days with NO LEFTOVERS to take to work for lunch, I planned ahead last night: sliced veggies and made bagel dough before we rushed off to a kid performance, then boiled and baked the bagels when we got home even though I was reeeaaaalllly tired. Have been thanking myself all day. 2) Hubs got a gift card to a local pizza place as a thank you for coaching a kids’ soccer team. When we realized yesterday afternoon that kid performances were interfering with dinner, he told littlest how to use the gift card (home on his dresser) to order her favorite kind of pizza and have it delivered. She did so, and is SO PROUD of herself. Learning to spend $ on take-out at age 11 = not frugal, but solving that last minute dinner problem with no $ out of pocket was a win. 3) Loaded all of littlest’s outgrowns in the car. They aren’t frugal hand-me-downs to a dear friend while they’re sitting on my kitchen table. 4) Mentioned to soon-to-graduate daughter that her older sis had bought a graduation dress. She said, “I have plenty of dresses. Why would I bother?” So there’s an expense avoided. 5) Not frugal in the short term: hubs took the broken car to a VW specialist. Yes, the repair is just as expensive as our regular mechanic suspected. But specialist says it’s totally worth it, the car has 100k+ miles of life left in it. Thinking of $1600 in terms of a cent and a half per additional mile is making the repair easier to swallow. Good score on the Dyson! One of my best GW buys was a $7 Bissell carpet shampooer. I love that thing. 1) We had a Team work day on Wednesday, so our Boss had lunch brought in from Panera Bread. Yummy free lunch. 2) Drinking the free coffee and making my own breakfast each morning. I bought the stuff to make salad here at work and stuck everything in the crisper. That makes it easier, for me, than trying to remember to make it at home. 3) Last time we visited the A-Z store, I bought 3 boxes of the Rite-Aid brand of Emergen-C for a $1 per box. I try to remember to drink a packet every day. It seems to help me ward off germs better. 4) I used a 20% off email coupon from our local Farm & Ranch store to buy some more Bute-less for the horse. I’m glad I didn’t buy it last week, since the coupon was only good for two days this week. Sometimes savings are all about the timing! 5) I’m paying for lunch out today with one of my best friends. It’s her Birthday, however, instead of buying her “stuff” I’m going to get her a gift card from PetsMart. We decided long ago to exchange gift cards so we can get snacks for our fur-babies, instead buying each other junk we don’t need. She loves Rib Crib, which makes lunch low cost – they have a lunch menu with specials that keep it cheap. This is our monthly lunch date too, so we get to enjoy chatting and catching up on each other’s news. It’s a good day!